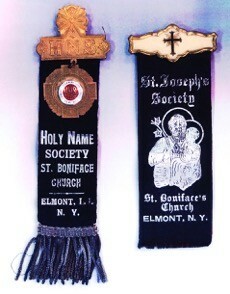 The St. Joseph Society was founded in March 1876 by a group of working men of St. Boniface parish. St. Joseph, as patron saint of working men and model of fathers, was chosen to be the Society's patron and model since most of the members were both workers and family men. 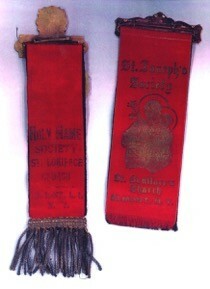 The St. Joseph Society was organized as a social and mutual benefit group. That is, each member paid a small amount into the treasury (the "Kasse") on a regular basis. If the member was disabled, the other members of the group endeavored to assist and upon the death of the member the widow received a cash benefit called "Sterbegeld." 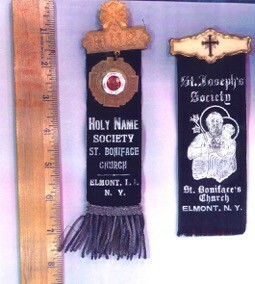 Above are pictures of ribbons commemorating St. Joseph's. To see other pictures of Fosters Meadow artifacts and history, please click here.